I love Chanel. The first thing I’d buy if I won the lottery is a big fat Chanel handbag. And some Chanel shoes. And belts, and scarves, and jewelry…ok, you get the idea. 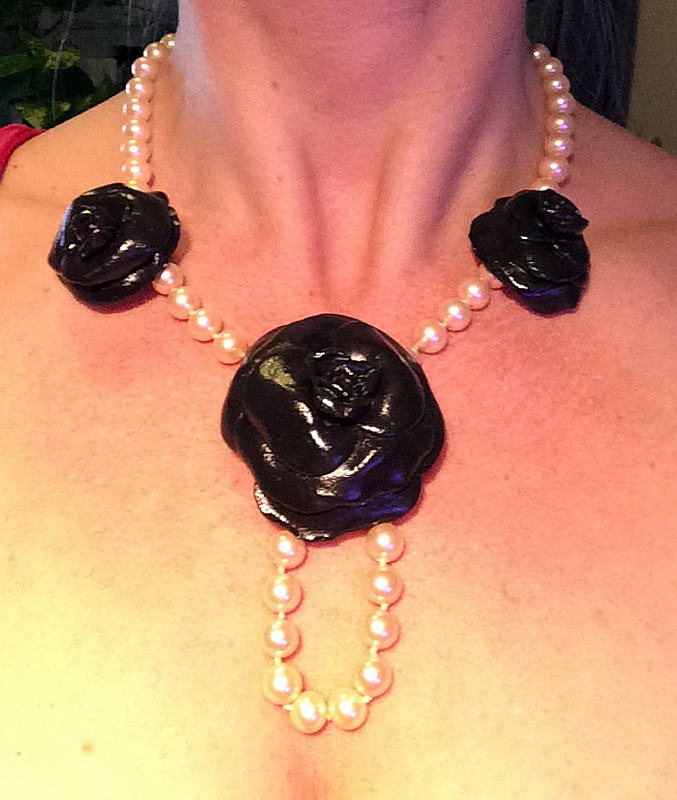 So in the meantime, I’ve created this Chanel-esque camellia necklace from painted polymer clay (Super Sculpy) and a vintage faux pearl necklace. 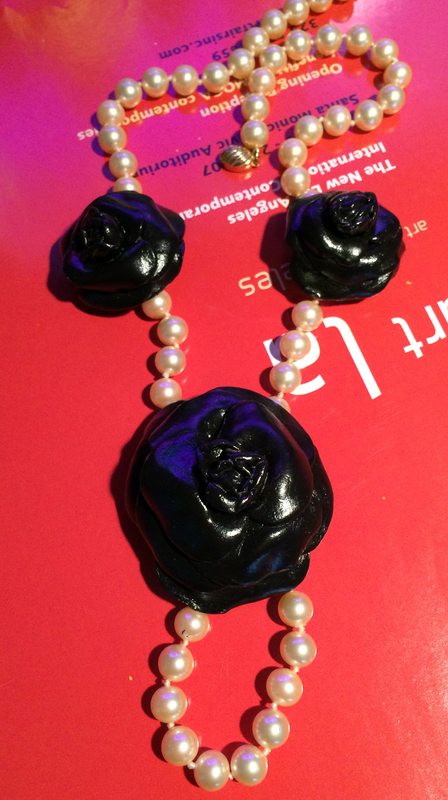 I sculpted the camellias out of polymer clay. I promise they are easier to make than you think. (See the how-to’s on that process HERE) Before baking, I pressed the pin-back into the clay so there would be a solid indented spot on the back to glue it into once it cooled. 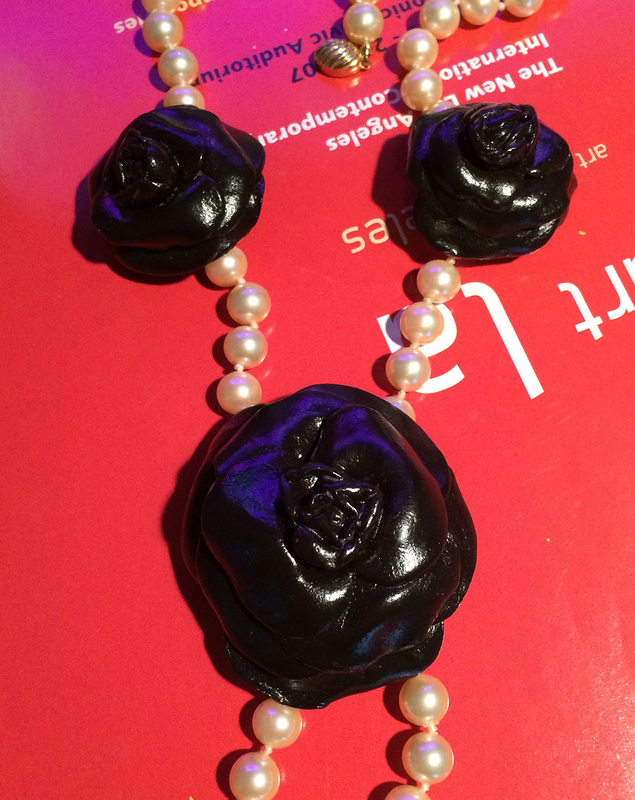 Though I am showing it here as a necklace, I put pin-backs on all three camellias so I could also where them on jackets, hats, scarves, wherever I need a little touch of Coco 😉 I chose to paint them black, but you could pick any color you like. 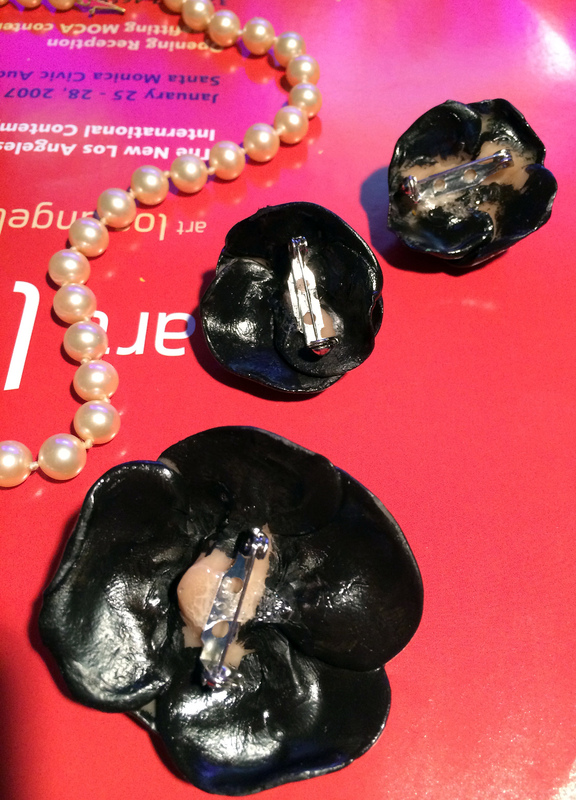 They are painted in black acrylic paint and coated in a semi-gloss clear coat. 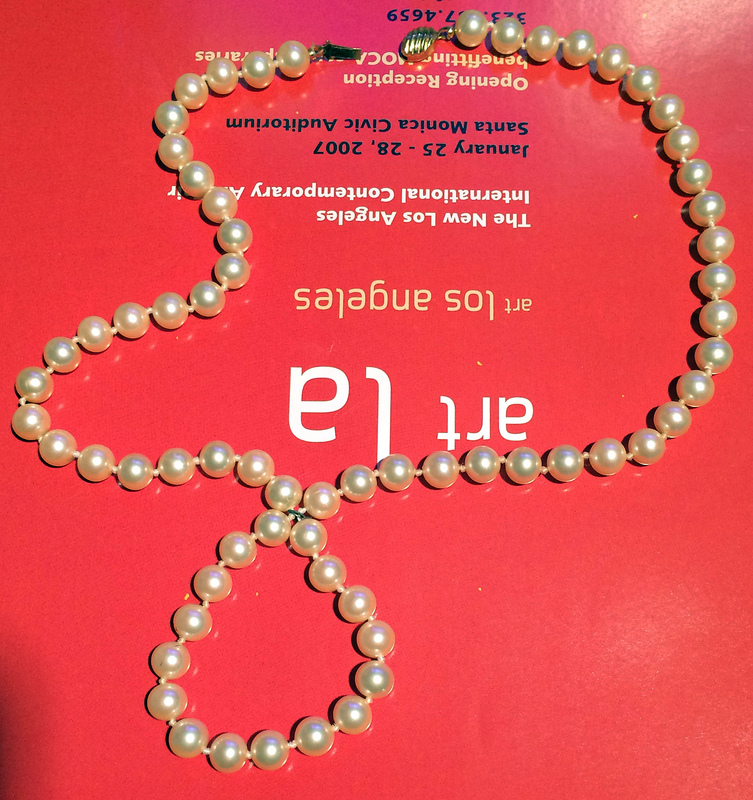 I used a faux pearl necklace I had gathering dust in my jewelry box. I made a little loop in it by simply twisting a little wire on. I could have left the necklace as is too, I just like the way this looks. Just place the pins where you want them and voila! 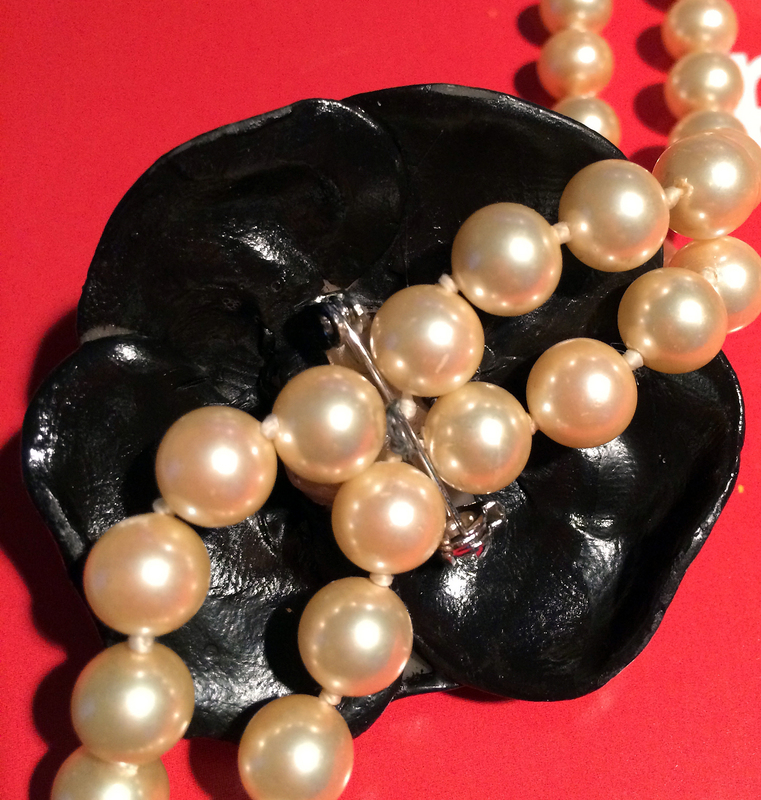 Use your neat old vintage pins on pearls like this and you’ll have a unique statement necklace instantly! I love how this turned out. Ideally, I’d wear it with multiple strands of pearls like Miss Coco herself. What amazing DIY project did you tackle this weekend? I’d love to hear about it in the Leave a Reply/Comments section. 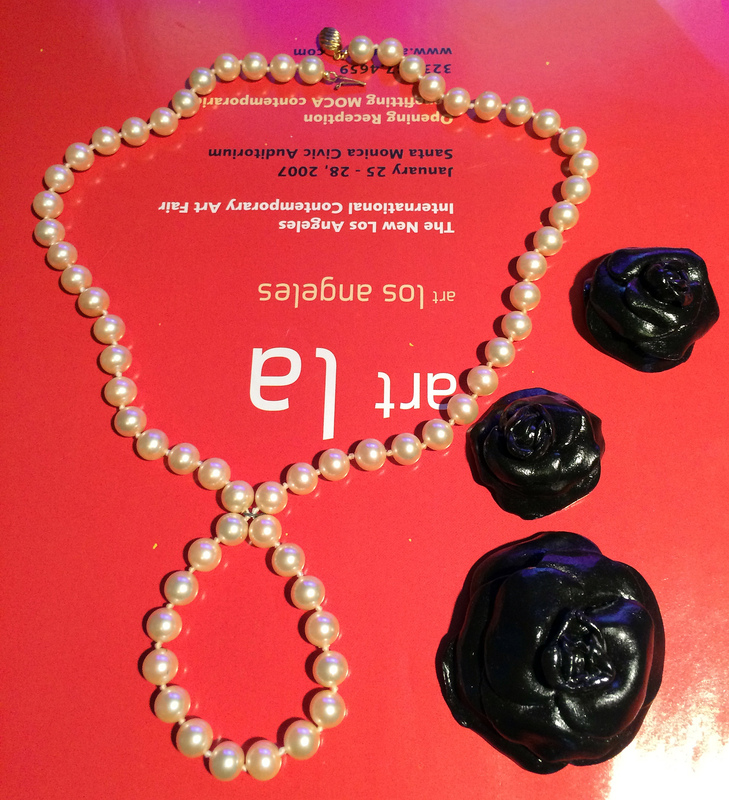 This entry was posted in art, Beauty, DIY, Jewelry, lifestyle and tagged art, budget, camellias, Chanel, chanel camellias, Chanel jewelry, Chanel-esque, clay camellias, Coco Chanel, designer, designer labels, DIY, DIY Chanel jewelry, diy jewelry, fashion, faux pearl necklace, ode to Chanel, pearl necklace, personal style, polymer clay, polymer clay jewelry, sculpy jewelry, style. Bookmark the permalink.